Education for Your Vocation - our back to school issue. It seems natural that September should be our educational issue as most of our young folks are getting back to school. 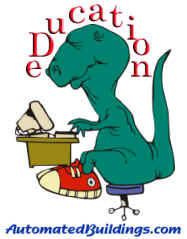 I like this old retro picture of the dinosaur student as it reminds us that there is a little dinosaur in us all and we need to keep at the task of self-education. The dinosaur student has been on our education page since ever but when I started to review our education links I was amazed how many still link to very valuable resources. Rather than rework the complete section we have corrected a few broken links and have chosen to add new information (mostly links to 100s of videos). If a picture is worth a thousand words one can only guess the value of a video. Videos do a great job of summarizing our work and the ones that we have linked will allow us to quickly continue on our journey with the Education we need to keep us current in our Vocation. If you are aware of any other resources for our education page please share with me in an email. We are very pleased to announce our four free education sessions to be held at AHR Expo 2015 Chicago. This is our 16th year of providing these educational sessions. We acknowledge the ongoing support of International Exhibitions in providing the constant venue and thank them for their support of industry education. Growing the Building Automation Industry Younger with Internet of Things (IoT), open cloud, and collaboration. Addressing the Skills Gap, Understanding that our People are our only Asset, an education session. How Smart Automated Buildings and IoT create Smart Cities. Third annual Connection Community Collaboratory meeting. I am very pleased with this year's line-up of sessions and to be joined by Paul Oswald in our first ever addressing the skill gap session, very important for our industries’ survival. We have added to our education page Videos that help explain Smart Automated IoT Buildings; these videos help depict Building Automation, Smart Building direction and the internet of everything. The videos, some which are dated, challenge us all to make what is possible, possible. Although most of them were created by large companies they need us all in the industry to make these dreams come true. I hope these well done promotional videos will allow us quickly to communicate and attract the attention of the youth we are seeking for our IoT journey and help them become excited about joining us. Video is the new medium for training and we have provided links to hundreds of videos that are free to help you better understand. The videos were made to instruct on the use and setup of products and services but understanding how all these products interact is the real education. It is OK to fast forward a video to see if it contains the info you need to learn. ControlTrends Amazing Video Training Resource was created to provide controls professionals a place to learn and share information about the rapidly changing world of commercial and industrial controls. This web site includes product demonstrations, training videos, technical blogs and news. Training, Tools, & Demo Picks has some of the great resources our advertisers and others have on their web sites that will help you understand deeper the pieces necessary to bring our industry online. Also where and how do we get connected to University, College, plus links to Higher Education Resources? Well here is a start. We are very committed to education and have redefined our mission statement to include our commitment to educating our readers. As you can see it has been the underpinning of AutomatedBuiildings.com since inception. From time to time we reset and adjust our mission statement. It is interesting to view how it has changed but has always maintained the same focus for 16 years. Our Mission - To usher the building automation industry into the next phase of IT/BAS convergence, the Internet of Things as set in September 2014. As always this new issue is a source of education for us all with great articles, columns, reviews, new products, interviews and of course the steady stream of news depicting our rapidly evolution and journey.